How does your dog feel about riding in your car? If it has no fear and loves a road trip, chances are it will jump right in. On the other hand, if it's afraid, it may struggle with you as you're trying to get it safely inside the car and whine or act up the whole way. Although this is a common dog phobia, it can be discouraging, distracting, and a potentially unsafe way to drive. Fortunately, most people are able to help their dogs overcome this fear and become comfortable during car rides. 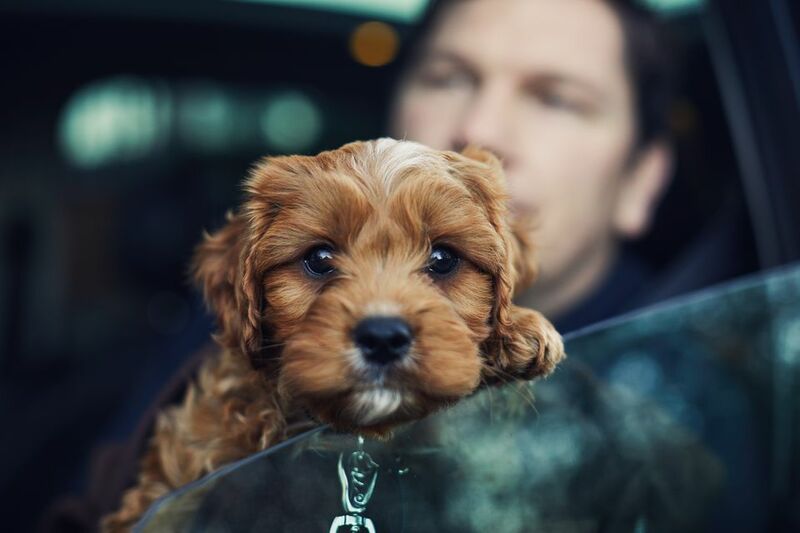 The key is to gradually introduce your dog to the experience while associating the car with good experiences, including lots of positive reinforcement. Why Do Dogs Fear Car Rides? There are several reasons your dog may be scared of riding in your car. Your first move is determining which one is affecting your dog so you can figure out what to do next. Just as people do, some dogs get car sick. They may feel nauseated or even vomit during car rides. If this sounds like your dog, that queasy, sick feeling may have conditioned it to become fearful of riding in cars. Dogs that aren't used to going on car rides may be disturbed by the odd feeling of riding in a car. Cars usually have their own smell, and there's also the sound of the engine, the vibrations of the floor, and seeing everything whizzing past at a fast speed. Any or all of these things may make for a very frightening experience for your dog. Some dogs associate the car with negative experiences, which can easily develop into a fear. ​For instance, the only time many dogs set paw in a car is for a trip to the veterinarian. If your dog has negative feelings about going to the vet, those feelings may transfer to car rides. If you adopted a shelter dog, the likelihood of its having had traumatic experiences that you don't know about increases. It's possible that the dog's only encounters with car rides were the trip to the shelter (or to a spot where it was abandoned) and the car ride to a new home. These frightening experiences could also account for a car phobia. Similarly, a dog that's been involved in a car accident or hit by a car may have long-lasting fears about cars in general. If your dog's fear of the car is related to car sickness, there's a fairly easy fix as dogs are able to take some over-the-counter medications to ease motion sickness. Talk to your veterinarian about the proper brand and dosage and whether this is a good option for your dog. It may also help to avoid car rides soon after your dog has had a meal. If your dog's fear of car rides stems from more than motion sickness, chances are you'll have to put a bit more time and effort into getting rid of its phobia. By slowly introducing your dog to the car and creating a positive association with the experience, you can help your dog enjoy car rides. Begin by enticing your dog to the car rather than forcing it to approach. Many dogs with this fear start putting on the brakes as soon as the car comes into view. Instead of dragging your dog to the car, slowly lure it closer using lots of treats and praise. For a mild car phobia, you may be able to get your dog to walk up to the car in a few short training sessions. For more severe phobias, it may require several sessions. To make it worth your dog's while, use valuable, delicious treats or its favorite toys. Continue using positive reinforcement to lure the dog inside. Start by opening up all the doors so your dog won't feel trapped once inside. Use treats and praise to coax your dog into the car. This often works better if two of the dog's favorite people work as a team. One can hold the dog on a leash on one side of the car while the other lies across a seat from the other side, using treats and a happy tone of voice to encourage the dog to get inside. Have some special bonding time with your dog inside the car. Don't rush to slam the doors shut and start the engine the minute your dog finally hops inside. Instead, leave the doors open and spend some time snuggling. Slowly work your way up to sitting in the car with the doors closed. Depending on the level of your dog's fear, this part of the process can take as long as a few weeks or more. Start your engine. When your dog has become fairly comfortable hanging out with you in the car, start it up. As soon as the car is running, give your dog some treats and talk to it in an encouraging tone of voice; then turn off the engine. Repeat this several times until your dog is completely comfortable sitting in the car with the engine running. Begin with small trips. Don't make your dog's first car ride a long road trip. The first few times out of the driveway should probably be no farther than around the block, with your helper giving your dog treats the whole way. Gradually work your way up to longer distances. Take your dog to fun destinations. Your dog's first long car ride should not be to the veterinarian. Instead, take it someplace fun, like the dog park, the beach, or to a drive-thru for a small bite of hamburger. Your dog will soon associate these fun times with going for a ride in the car. Be patient and consistent with your dog and work in short sessions. Keep things positive and end each session before your dog has a chance to go into full-blown fear mode. All dogs are different, and depending on the degree to which your dog is afraid, you can expect it to take a while for your canine buddy to conquer its fear. You may even need to go back a few steps if your dog unexpectedly reverts to fearful behaviors, which is OK too.